This will upgrade your TO3000 license to Projetex 1 Server and 1 Workstation license. 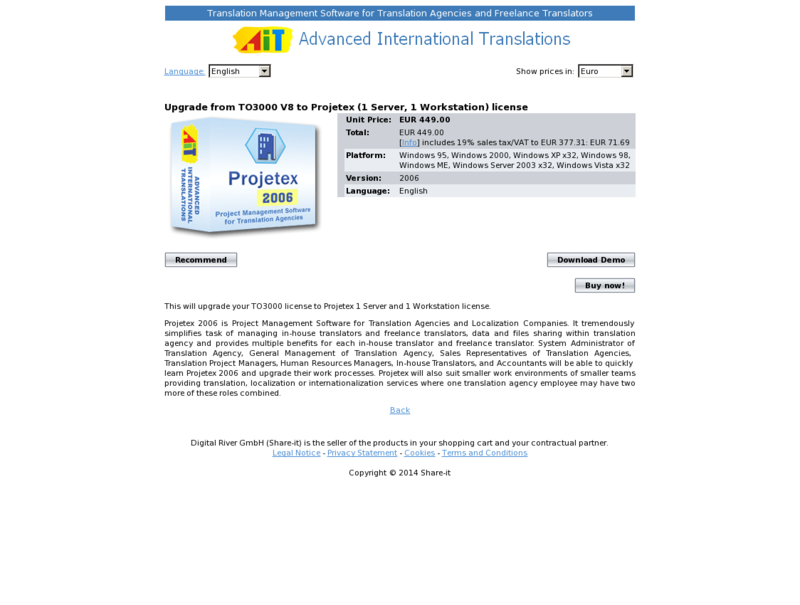 Projetex 2006 is Project Management Software for Translation Agencies and Localization Companies. It tremendously simplifies task of managing in-house translators and freelance translators, data and files sharing within translation agency and provides multiple benefits for each in-house translator and freelance translator. System Administrator of Translation Agency, General Management of Translation Agency, Sales Representatives of Translation Agencies, Translation Project Managers, Human Resources Managers, In-house Translators, and Accountants will be able to quickly learn Projetex 2006 and upgrade their work processes. Projetex will also suit smaller work environments of smaller teams providing translation, localization or internationalization services where one translation agency employee may have two more of these roles combined.